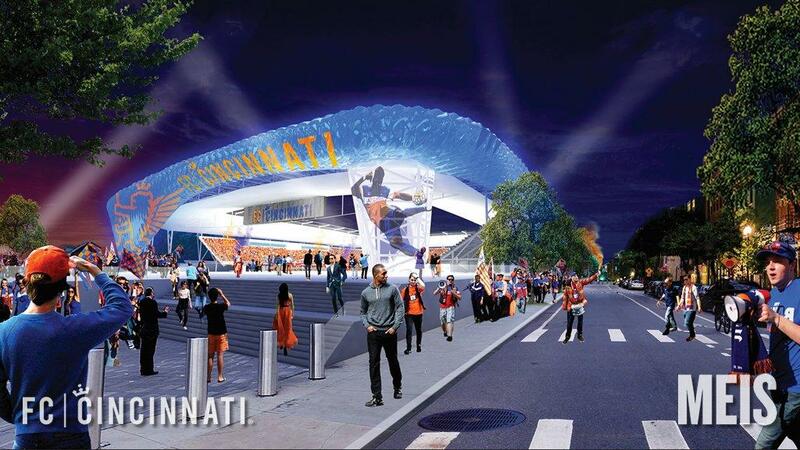 A Cincinnati Council committee and the Cincinnati Public School (CPS) Board are holding a joint meeting Tuesday afternoon and the proposed FC Cincinnati stadium for the West End is on the agenda. Club President and General Manager Jeff Berding presented a plan to the school board on Feb. 12 to build its new home where Stargel Stadium currently sits in the West End. The team would, in exchange, build CPS a new stadium along Ezzard Charles between John and Cutter Streets. The deal is dependent upon FC Cincinnati receiving a Major League Soccer expansion franchise. Council Member and committee chairman P.G. Sittenfeld said it's important for the two bodies to have a conversation about the stadium plan. "Because at the end of the day, the possibility of a stadium going into the West End, the two government bodies that will need to sign off and allow that to happen, one is the school board and the other is City Council," Sittenfeld said. "Those two bodies haven't had an official meeting where the various elected leaders were coming together to kind of understand the situation through one another's eyes." Sittenfeld said he's looking forward to hearing from school board members about their thoughts on replacing Stargel Stadium, community engagement with the West End community, and what questions the school board may have for council members. No votes are expected on the issue at the joint meeting. When City Council voted on a funding package for a proposed stadium in Oakley, Sittenfeld voted against that funding proposal and expressed skepticism about stadium economics while acknowledging the energy FC Cincinnati has brought to the city. Sittenfeld said he's looking for a "win, win, win" when it comes to the stadium issue. "Good for the school board, good for the city as a whole and also good for the West End," Sittenfeld said. "I think we'll see how much room there is for something like that to be achieved or not." After a public hearing last week at Taft Information Technology High School, school board members said they're not close to making a decision after hearing more than two-and-a-half hours of public testimony from supporters and opponents. Many of those speaking against the deal identified themselves as West End residents, and say they're worried about the effect a stadium will have on the neighborhood. Some questioned the economic benefits promised by the club for the neighborhood, and still others pointed to gentrification as the reason for their opposition. Cincinnati Council passed a motion earlier this month asking that a "community benefits agreement" be part of any proposal with the team. That agreement would be tied to awarding city development incentives, infrastructure funding, zone changes, or other city support for the project. FC Cincinnati is open to such an agreement. Berding says the site must be best for the club, but also must be a positive addition to the community. He previously said if the West End didn't want the stadium, it would be built elsewhere. Sites in Oakley and Newport are also still under consideration.